Essex County Council have been early adopters of social media channels for sharing important messages and promoting their services. In Summer 2016, the Council began to respond to individual comments and questions directed at their two main social media channels on Twitter and Facebook. Taking this step is no mean feat: Essex is one of the largest counties in England by number of residents, with a diverse population, infrastructure and different layers of local and county-wide administration and responsibility. This is important because it means inbound questions to the Council’s Customer Service Team cover all manner of topics, from weather, schools or roads, to care services and libraries. The front-line Customer Service Team have accrued a huge bank of corporate knowledge, and when they don’t have a ready answer, they’re quick to find one. 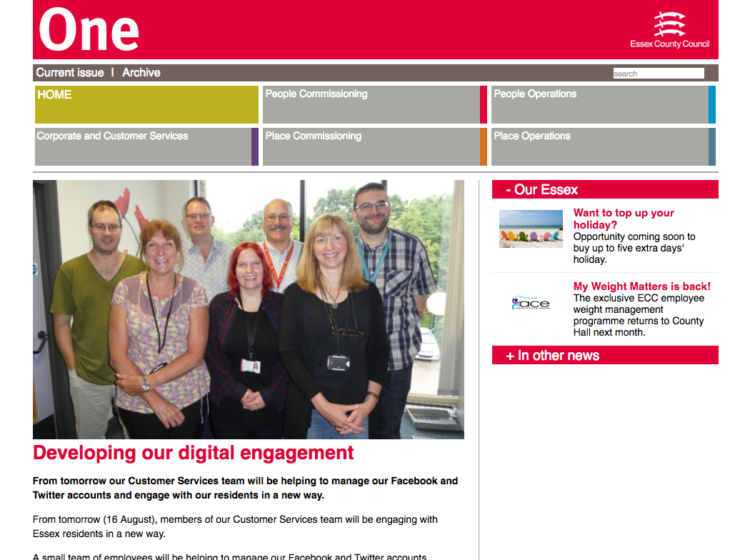 This meant they were well placed to take on the role of engaging with residents on social media. The Council took the enlightened step of sharing responsibility for these channels with the Customer Service Team, who embraced the challenge despite having to factor this work into their existing team. We helped the team to build their confidence and skills online, by running a one day workshop to explore the different situations they may encounter and discuss options for responding. Using our Crisis90 platform we took the team through a real-time, phased crisis scenario. This gave them the opportunity to rehearse monitoring, planning and live Twitter responses to online characters who were tweeting questions at them, all within a private online environment. Each member of the team also took away a Digital Action Plan: six goals for each of them to complete online in the two months following the workshop. The aim of this was to consolidate their confidence after the workshop had finished, during the period in which they launched online customer service. Each goal is accompanied by a task to test an individual’s learning and encourage them to get hands-on with a tool or technique. Confidence and experience among the team were mixed when we first met them. However, it’s clear that with some guidance, support and encouragement (not least of which from the digital team at ECC) they are the best team for the job. Empowering a team in this way helps them to develop a new set of skills, and reveals an additional level of passion for their work. Their social media feeds are testament to the pride they take in helping residents. Most days you can see responses to questions or comments that would have gone unanswered, online, a year ago. We’re especially pleased that the team choose to sign-on with their first names at the beginning and end of their Twitter and Facebook shifts.